In this section we have selected the most Frequently Asked Questions that our students ask us, as well as the answers from us. We hope these answer all of your questions. Why study at Instituto Hemingway? Instituto Hemingway offers many different education programs that allow you to reach total immersion in our culture. Learning a new language, jobs and work experience or sporting and cultural activities are some of the programs that we offer you and that enable you to enjoy your stay in your new country. Why are we called Instituto Hemingway? Because Ernest Hemingway, the famous American Nobel prize winning writer, travelled and went discovering Spain and he made many great friends here. This is exactly what we want for our students, that they integrate whilst travelling, that they learn lots and make many friends with whom to practise their Spanish. Why was Instituto Hemingway founded? Instituto Hemingway was founded in Bilbao (Spain) by bilingual people who had been closely linked to the education sector for a long time. Conscious of the need to offer programs that are thorough and rounded, fun and flexible, we created this new innovative proposal. New ideas for people of all ages that want to learn and live in a new country. Who makes up the Instituto Hemingway team? The Instituto Hemingway team is made up of young and lively people who know the advantages and challenges of living in another country. And the most important thing, we are available and ready to make your stay with us a truly unique experience. Is Instituto Hemingway counted amongst any accredited centres? 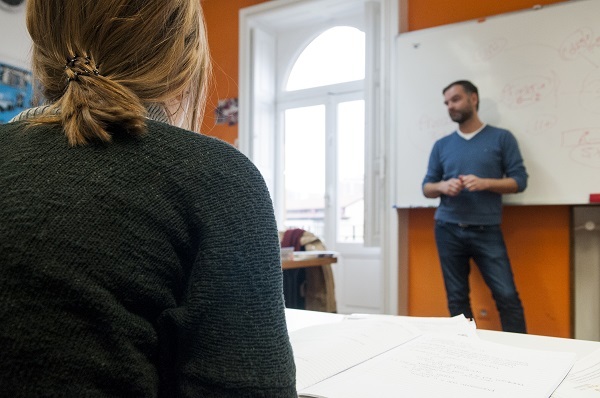 Instituto Hemingway is a Centre Accredited by Instituto Cervantes for the teaching of Spanish as a foreign language and forms part of the Network of Associated Centres of Instituto Cervantes. It means the recognition of a high level of quality of Spanish teaching and resources available to the student at the school. It is also accredited by CSN (The Swedish National Board of Student Aid). Bilbao is one of the most interesting and vibrant cities in Spain, surrounded by mountains and wonderful beaches. It is the main city in the North of Spain known by its university life, tapas bars, shops and cultural activity. How can I get to Bilbao? Bilbao has an international airport with multiple flights to different European cities. You can also fly to Santander or Vitoria. In the case in which you are coming from another continent you will arrive in either Madrid or Barcelona and will take a connection flight to Bilbao, arriving here in an hour. We also offer a transfer service from these airports to your accommodation. Instituto Hemingway has available a phone number that you can reach over the whole weekend. How many inhabitants are there in Bilbao? Bilbao has approximately 350,000 inhabitants. It is a medium-sized ciudad with an excellent public transport system. It is a touristy city? Is it expensive? Bilbao isn't a typically touristy city although more and more people from all over the world are coming to know us. It is still all to be discovered. The relation between quality of life and price is very good and the ample offer of shops can be taken full advantage of. Furthermore, if you like good food, you will find exceptional bars and restaurants on offer. What sports are there to do in Bilbao? You can play a wide range of sports: football, basketball, volleyball, tennis, squash., furthermore many watersports: sailing, surfing, diving. What is the minimum age for each course? There is no minimum age. We have courses available for all ages. Do I need to have a certain level of Spanish in order to study at Instituto Hemingway? No. Upon your arrival at Instituto Hemingway you will take a simple test that allows us to see what level you're at and place you at the appropriate level. When can I start the course? When do I have to book? You can start any Monday of the year. It is recommendable to reserve at least 15 days in advance although we do admit students who book at the last minute. We offer the six levels that correspond to the Common European Framework A1, A2, B1, B2, C1, C2. The levels are grouped into beginner, intermediate and advanced. If I am going to be spending a lot of time in Spain, can I also undertake the course whilst visiting other cities? Yes, through our Combined Centres program you can learn Spanish in any of the big cities like Granada, Barcelona, Valencia, Seville, etc. You can be sure of receiving the same quality of teaching, prices and conditions in whichever of the cities that you choose. What types of Spanish Courses are there in Instituto Hemingway? Besides the Main Spanish Course, you have available a Business Spanish Course and Refresher Course for Spanish Teachers. 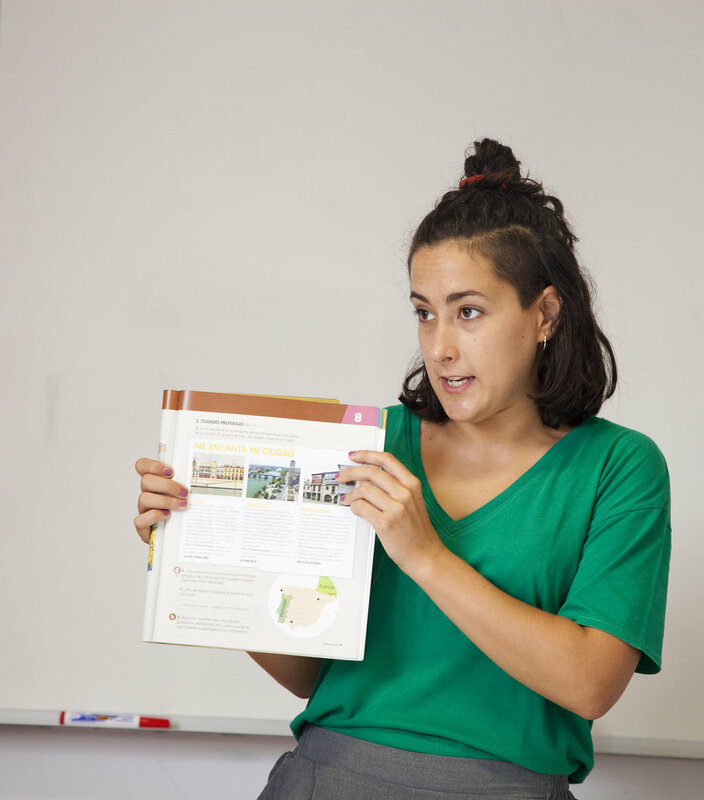 And of course you can complete your Instituto Hemingway learning experience with individual classes. Do Business Spanish Courses exist? We offer a course that allows you to come to grips with the economic and legal systems in Spain and Europe. Vocabulary, its commercial uses, behavioural manners within the workplace. Can I change course or level during my stay? Of course. If you think that your classes aren't tailored to your level, or if you progress at a different rate to your classmates, you can speak to your teacher or the Director of Studies in order to find the best solution. Are the classes made up to the students that are lost through national holidays? Instituto Hemingway closes on the days that are national or local holidays. However, we program in full-day excursions so that you may take advantage of your time by getting to know the nearby places. Can I combine the Spanish course with other courses that Instituto Hemingway offers at an extra price? Of course. You can choose between an ample range of courses and sports and leisure activities. Some of your options: surfing, horse riding, cookery lessons, flamenco, salsa, tennis, football, art. Can I combine the Spanish course with other programs offered by Instituto Hemingway like working in Spain or work experience? Yes, following a period of learning Spanish, and once you feel comfortable with your level of Spanish, you can undertake other programs like a job in Spain or some work experience on its own or a combination of one of these with the continuation of the Spanish course. Are there discounts for long stays? Yes, there are normally discounts from the third week into your stay and special conditions for those who stay more than three months. Do I get a certificate on completion of the course? Yes, on which the number of hours and level reached according to the Common European Framework to our course is specified here. At least 15 days in advance is recommendable for reserving accommodation. We accept reservations made right up until the last minute but the best way of guaranteeing your preferred choice is to book a fair way in advance, especially for the Summer months. What types of accommodation do Instituto Hemingway offer? You can choose between accommodation in a host family, a student residence or a shared flat. When will I receive the relevant details of my accommodation? We will send you the address of your place of residence at least a week before the course starts, together with a map of the city. When can I arrive and when must I leave by? All of our accommodation options are rented from the Sunday before the course starts until the Saturday after it finishes. Can I stay extra nights? Yes, you can stay for extra nights if you wish. Check our price list for more details. Can all the accommodation be found close to the school? All of our accommodation options are within a maximum of a 30 minute radius from the school. Are towels, sheets and bed linen included in the price? The sheets, bed linen and kitchen utensils are included in the price. You have to bring your own towels and the other necessary things that will result in your stay being as pleasant as possible for you. Is a cleaning service included in the price? This depends on the type of accommodation you choose. It is included in the host family and student residence options. In the shared apartment you are expected to participate in carrying out the domestic duties. Not generally. You receive health insurance and a pocket money or accommodation on a full board basis. So why is work experience important then? Because you learn about the working world of that country, as well its culture and bettering your level of language. You gain experience in the sector in which you wish to work and you see how things are done in a different country to your own. On your return this experience will be very important for boosting your CV and also for the promotion to better job positions. When and when can I carry out my work experience? Whenever you like and wherever you like. There is no time limit nor do we specify a certain town. You choose it all. Do I need to have a good level of spoken Spanish? No, depending on the sector a basic level should be sufficient. On other occasions you will be required to have at least an intermediate level. We recommend that before starting the work experience placement you take the Spanish Course for two weeks. Will I have time to visit other towns or countries? Yes, you can do this before or after the program or take advantage of the weekends or any free days to do some traveling in the country. Do I need a visa in order to do the work experience? The work experience placement is treated as an education program for which you will only need a student visa if you wish to stay for more than three months. Paid jobs. What sectors are available? Essentially just in hospitality management and teaching English. The best option is in hospitality management because this way you get accommodation and food included as well as a small salary. No, a basic level will suffice. Will I have time to visit other cities or countries? Do I need a work visa to take part in the program? The program is treated as educational for which you will only need to student visa if you wish to stay for more than three months. Can I sign up even if I barely speak any Spanish? Of course you can. The program is tailored to your level of Spanish. If your level of Spanish is low then you can choose to take subjects in English. It is a fantastic opportunity to get to know the Spanish university system, to improve your Spanish, make Spanish friends and to learn more about the Spanish history and culture. Furthermore you can build up credits for your home university. Do I need a visa if I don't have nationality from any of the countries that are members of the European Union? If your stay is less that 3 months (and with an extension of up to 6 months), the answer is NO. Your nationality should be from: Andorra, Argentina, Australia, Austria, Bolivia, Brazil, Brunei, Bulgaria, Canada, Chile, Chipre, Costa Rica, Croatia, El Salvador, United States, Estonia, Guatemala, Honduras, Iceland, Israel, Japan, Liechtenstein, Lituania, Malasia, Mexico, Monaco, Nicaragua, Norway, New Zealand, Panama, Paraguay, Korea, Romania, San Marino, Santa Sede, Singapore, Switzerland, Uruguay, Venezuela, particular regions of the Popular China Republic of Hong Kong and Macao. Where can the application for the visa be made? In the Spanish Embassy or Consulate that corresponds to where you live. The application for the visa as well as its collection are to be made in person, although in certain cases a representative can be designated on your behalf. What must be presented in order to obtain student status? Fulfill all the requirements for the entrance and stay in Spain, including the visa in order to further your studies. You have been in regular attendance at a language school. In this case, Instituto Hemingway. In the case of which students under 18 will be traveling without the accompaniment of their parents, authorization will be necessary for their displacement and in order to undertake the course. This authorization must be clear to the school and the duration of the stay predetermined. They have the guaranteed economic means necessary to cover the cost your studies, stay in the country and return to your own country. We provide you with a certificate for the payment(s) that you have made for you to present. What is the authorized duration of the stay? It will be the same length as that of the course which you are enrolled in. How long does the process of granting me the student visa take? A period of on average a month depending on the country. Can the authorization for my stay be renewed? Yes. If you decide to prolong your studies you can also renew the authorisation for your stay. Is it easy to get a work visa? No. In fact, you have more chance of winning the lottery. But remember that with a student visa you can work part time. Is it necessary to have medical insurance? Yes, unless you're a member of the European Union. Instituto Hemingway offers medical insurance at a very reasonable price. Is it normal to use public transport in Spain? In the whole of Europe public transport is very popular. It comes highly recommended being cheap and ecological. What telephone should I use in Spain? The best thing to do is to buy a prepay sim card for your mobile phone upon your arrival in Spain. They are cheap and you will be able to receive calls in Spain from any destination worldwide free of charge. In order to make calls to your country we recommend that you buy an international phone card or you make them through the Internet. Is the voltage of electrical products different to that in the EEUU and the United Kingdom? Yes. But you can solve this with an adaptor. When the time comes to choose a program, is there a notable difference between some of the Spanish cities? No. The lifestyle and cultural and historic richness is quite uniform. Our suggestion is that you opt for a lesser known destination to the average tourist and a destination in accordance with your personal preferences to do with the size of the town or if you prefer to be near to the beach or the mountains. How many countries make up the European Union? The Union is made up of 27 countries. The common currency is the Euro but this is only in place in 13 of the countries. There are no façades of any type and anybody with a nationality from one of the Union's countries can work or live in another country of the European Union without any restrictions or a visa.